Mom and I can't resist a tempting food commercial, so naturally when IHOP started advertising their new line of Hawaiian pancakes, we just had to go and check them out. By "check them out," I mean eat them. They just sounded too great to resist - pineapple upside down, banana macadamia nut, and strawberry passion fruit. Now, the only two IHOP restaurants that we've ever been to (Middletown, RI, and Dartmouth) are constantly busy, but we figured that, on a Tuesday morning, it would be safe to visit. We were dead wrong. We pulled into the packed parking lot of the Dartmouth location at around noon. We actually had to wait for a table, and this drives me absolutely crazy. Thankfully, I wasn't dying of hunger so there were no meltdowns to be had. We sat on one of the two long benches at the restaurant's entrance and waited for our name to be called. Mom and I had forgotten that the first week of July is normally America's vacation week. That's why IHOP was saturated with so many frenzied fathers, distracted mothers, and loud children. When we gave our name, the hostess told us that we would be waiting for about ten minutes. Thankfully, she was right! Mom and I were shown to a half booth/half table combo by the window (we asked for a table, but we didn't mind one of those). We were told that a waitress would be with us in a moment. Please note that the above picture was taken after the crowd had died down. When we first arrived at IHOP, there was no way I could have sneaked a shot without someone catching me. If you notice, there are several Hawaiian decorations in the window (palm trees, leis, pineapples, etc.). This adorable theme ran throughout the entire restaurant. Hawaiian luau music played in the background, palm trees were scattered across the dining room, and everything was colorfully decorated. The Hawaiian theme is the perfect promo for summertime breakfasts! Mom and I were soon greeted by our waitress, Carol C., who was very pleasant although she was quite busy waiting tables. She took our drink order - two mocha iced coffees ($2.49 each) - which we'd never had before but enjoyed very much. It was quite sweet and didn't need to be doctored up with any cream or sugar. When Carol returned to the table, she took our order. Mom chose the bacon and egg combo with pineapple upside down pancakes ($7.99), while I chose the ham and egg combo with banana macadamia nut pancakes ($7.99). Mom ordered her eggs scrambled, while I chose mine fried, which in restaurant terms is called "over hard." Who knew? Now everyone knows that I have hated eggs for a good 20-25 years, but have been trying to embrace them. I figured that I would just plop the ham on top of the egg and shove it in altogether like I was eating an omelet. I still can't eat plain eggs without gagging. I know; I'm weird. Considering the restaurant was so busy, both Mom and I were surprised that our food came out so quickly. IHOP really does have a great system for bringing out food and cleaning up the dining room. The customer isn't gone from the table for a minute before there is someone clearing off the dishes. I love that! It seemed that everyone around us was getting a side of Hawaiian pancakes, and Mom and I were no different. Mom normally doesn't get the hashbrowns that always come with a breakfast plate, but she forgot to ask for their removal, so they arrived on the side of her bacon and eggs. 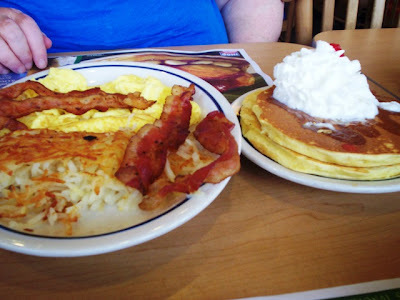 Her bacon and scrambled eggs were cooked perfectly, but IHOP usually never gets this wrong. The meats and eggs are always done well. Although Mom picked at the crispy top of the hashbrowns, she didn't really get into it because she's not a fan of any sort of potatoey sidekick. When she finally got to the pancakes - the star of the meal - she found them to be absolutely delicious and much lighter than expected. She was afraid that they were going to be overly sweet and on the heavy side with all the pineapple and whipped cream, but she was happily incorrect. They were light and airy, the pineapple gave them a candied taste, and the whipped cream on top made them moist enough to eat without any added syrup. It was a sweet end to a savory meal. My ham, eggs, and homefries were excellent! The ham was perfectly cooked, which I was quite thankful for as I don't usually order ham because I'm afraid it will be chewy. The over hard egg were nothing more than a big, flat egg. PERFECT! I put the ham on top, put a little pepper on it, cut it up, and enjoyed it. It was fabulous. The homefries, which are really just shredded potatoes, were tasty and crisp. I covered them in ketchup and ate every last one. My side of pancakes was heavenly. I, too, thought that they were going to be too sweet, but I was completely wrong. The pancakes, which had real bananas and crunchy macadamia nuts, were excellent. They really had so much flavor that, like Mom, I didn't need syrup. My cakes were also topped with whipped cream and a cherry, and that was all they needed. Although already full from my ham and eggs, I made sure to devour every inch of those pancakes. It wasn't hard, trust me. We left $26.50 on the table for Carol, which included a 20% tip. She was an excellent waitress. Before leaving, Mom and I paid a visit to the restroom. Normally at busy times of the day, a restaurant bathroom can get pretty disgusting. Thankfully, this was not the case. It was very clean and organized. 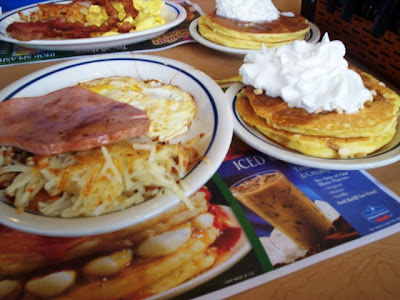 Thinking back, Mom and I have never had a bad meal at IHOP. 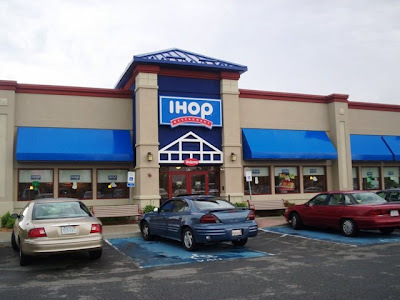 Although it can get a little loud and crazy, and the Middletown location's long and narrow building makes for some uncomfortable seating, we always know what we're in for when we visit IHOP - good service and great food. Plus, they serve breakfast all day. Mom and I love late night omelets! The IHOP in Dartmouth is located at 47 Faunce Corner Road. 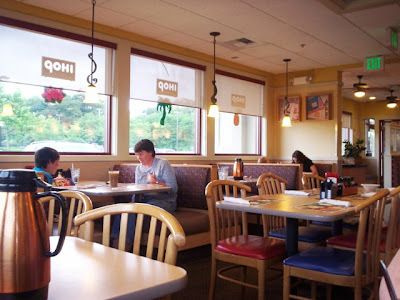 For more information, call (508) 996-1999 or visit the Web site at www.ihop.com.